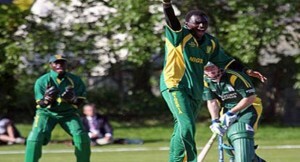 Nigeria on Thursday lost to Botswana by one wicket at the ongoing Under-19 Cricket World cup qualifiers in South Africa. Nigeria batted first scoring 101 runs all out in 39.3 overs. The nation’s top scorers in their innings were Taiwo Mohammed, 24; Sylvester Okpe, 23 and Sulaimon Runsewe, 15. In the second inning, Botswana raced up to 103 for the loss of 9 wickets in 31.5 overs, to win the match. Nigeria will play Ghana on Saturday and Tanzania on Sunday. It’s a round Robin league and the top two teams will qualify to Division one. Team Nigeria had beaten Zambia to record a first victory at the second division of the 2016 ICC U-19 Cricket World Cup Qualifier.